New York Blood Center (NYBC) presented the Second Milstein Cord Blood Symposium on April 10 at NYBC’s Murray Sargent Auditorium. 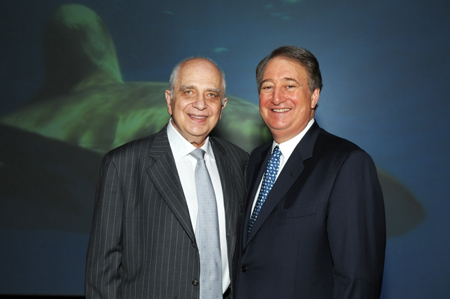 The symposium – and an opening reception on April 9 at the Milstein Hall of Ocean Life at the American Museum of Natural History hosted by NYBC Chairman Howard P. Milstein – also celebrated the FDA’s recent approval of HEMACORD™, a cellular therapy product developed and manufactured by the Howard P. Milstein National Cord Blood Center. More than 200 scientists, doctors, and professionals in the medical community attended the symposium. HEMACORD™ is the first FDA-licensed hematopoietic progenitor cells-cord (HPC-C) cell therapy, approved in November 2011. HEMACORD™ uses cord blood stem cells to treat certain disorders of the hematopoietic, or blood forming, system. Research is currently underway to examine whether hematopoietic stem cells derived from umbilical cord blood can be used in the treatment of other disorders. 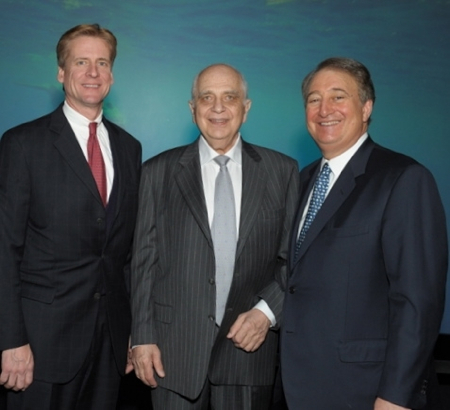 NYBC President and CEO Christopher Hillyer, M.D., NYBC Vice President Pablo Rubinstein, M.D., and NYBC Chairman Howard Milstein (left to right). The symposium was hosted by NYBC President and CEO Christopher Hillyer, M.D., and NYBC Vice President Pablo Rubinstein, M.D., Program Director of NYBC’s National Cord Blood Bank Program In 1989, Dr. Rubinstein presented the original concept of public cord blood banking to the National Heart, Lung and Blood Institute of the National Institutes of Health. In 1992, he founded the world’s first public cord blood program at New York Blood Center, which is still the single largest repository of cord blood units in the world. 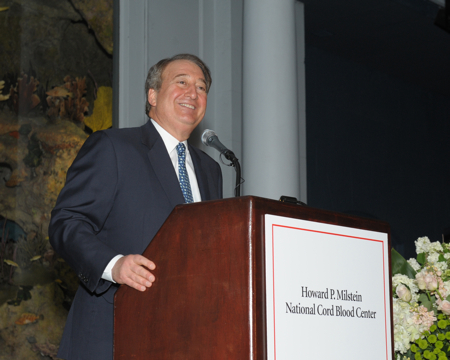 “This symposium is a testament to the remarkable progress that has culminated with FDA approval of HEMACORD™,” Mr. Milstein added. Speakers at the symposium presented information relating to the cellular mechanisms of blood cell and autoimmune diseases and their possible control by cord blood stem cell populations. The speakers discussed research concerning whether stem cells derived from cord blood may prove beneficial for gene therapy, thus opening up a wide array of therapeutic applications for treating certain blood cancers and inherited metabolic and immune system disorders. Speaking at the Symposium were Hal E. Broxmeyer, Ph.D. (Indiana University); Paul S. Frenette, M.D. (Albert Einstein College of Medicine); J. Alejandro Madrigal, M.D., Ph.D. (Anthony Nolan Research Institute); Andromachi M. Scaradavou, M.D. (National Cord Blood Program); Elizabeth J. Shpall, M.D. (M.D. Anderson Cancer Center); Marcel R. M. van den Brink, M.D., Ph.D. (Memorial Sloan-Kettering Cancer Center); Jon J. van Rood, M.D., Ph.D. (Leiden University); and John E. Wagner, M.D. (University of Minnesota), who are among the leading physicians and scientists who specialize in cord blood banking. 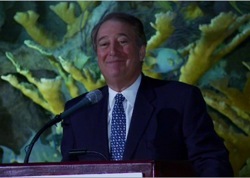 Howard Milstein welcomes participants in the Second Milstein Cord Blood Symposium to a reception at the Milstein Hall of Ocean Life at the American Museum of Natural History. Howard Milstein welcomes participants to the Second Milstein Cord Blood Symposium at the New York Blood Center's Sargent Auditorium.